With a couple inches of snow on the ground, showing an annoying inclination to freeze and stick around for the next decade or so, we have discovered a veritable freeway system of animal tracks in The Back Forty. Not dainty little cat paws and squirrel prints, mind you, although they are part of the mix. Instead, they're big tracks. 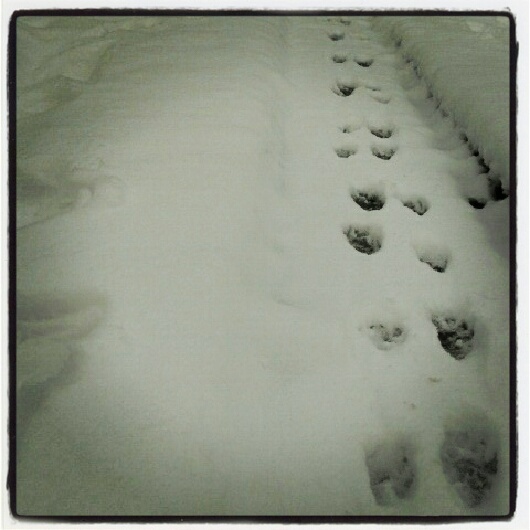 Big non-dog tracks. Our new neighbors first made their presence known last week. 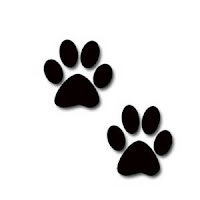 I noticed the faint impressions of their footprints circling around the trash can. "I think we have a raccoon jones-ing around the trash," I told my date over coffee later that morning. 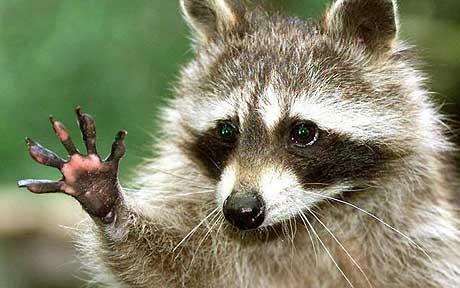 Raccoons and trash can are NOT a good combination. "It's probably just some cat," my date rejoined. THIS is what was circling around the trash can. Fast forward to Christmas morning. With fresh snow on the ground and a hint of blue sky teasing the Ponderosa pines that tower over our neighborhood, the Back Forty was illuminated with watery, wintery sunlight. 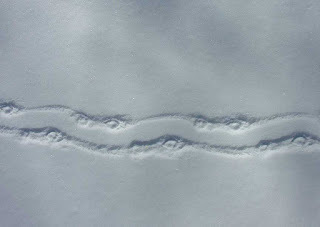 Revealing, of course, our own little Interstate 90 of animal tracks. "Those are pretty big paw prints," my date admitted. Hah! Vindication! Now, in addition to being a Queen and Supreme Goddess, I am an official Wildlife Tracking Specialist. With a small assist from Google Images. Intrigued, we tumbled into our boots and took a turn around the Back Forty, which took all of about 5 minutes. We do, indeed, have raccoon neighbors. A couple by the looks of things. Fortunately (or unfortunately depending on how you feel about critters; let's just say we briefly considered night photography and motion sensors) our furry four-legged neighbors are nocturnal and somewhat solitary. It is unlikely either will tangle with Ben -- or us -- at least in the next few months while we are all cozied up inside our respective dens. 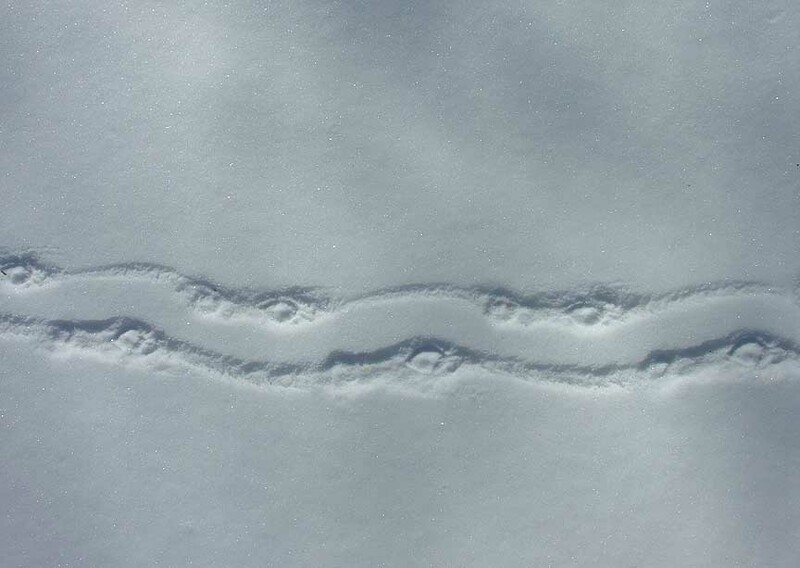 We'll keep an eye out for fresh tracks. . . perhaps catching a glimpse of our visitors at dusk or at dawn. And as long as no one shows up in black and white stripes -- or messes with the trash can -- we'll all get along just fine. Did somebody say "Trash can?" Excellent investigative work, Queen! 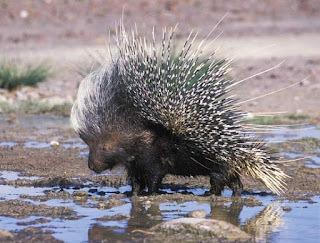 I remember porcupine quills lying around my childhood backyard. Luckily none in my dog's nose. Racoons I can deal with, but am very thankful there are no porcupines in my area. Skunks we have plenty of, and so far I have just been lucky that my dogs haven't chased/caught one. Interesting how these nocturnal skulkers seem to be everywhere. I've seen a few around here too, but we don't have the tell-tale snowy footprints to give them away!